One of my favorite pieces of furniture is an old wicker chest my mom purchased for me when I moved into my first apartment. It’s held many uses from tv stand, to window seat, to coffee table. Wicker is light-weight and easy to move, affordable, and has an interesting texture that helps bring warmth to the room. Here’s how Project Nursery readers are using wicker and rattan. This wicker shelving unit is a fresh addition to Finley’s Nursery. It’s clean lines and glass shelves keep this piece looking crisp and modern. 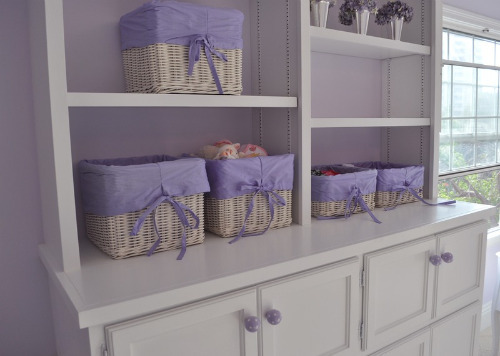 These cloth-lined wicker baskets from Pottery Barn bring a sweet and soft element to Liesl’s Nursery . In this nursery by designer Christina Salway rattan lighting is used to add some depth to the room. These shades were kept they’re natural color which picks up hues in the similarly simplistic wall art. Do you have a favorite wicker piece in your nursery? Share them with us by uploading to our Real Gallery. COOL. When you say wicker, people think about patios and outdoor furniture :) It’s nice to see them moving indoors. They are beautiful! You are right, Jonni and Adrienne, these are wonderful pieces! I used to avoid wicker because I’ve always associated them with the porch furniture we had when I was growing up. I remember seeing all those strands sticking out of the chairs and tables and how ugly it was. But seeing these pieces, I think I will be looking at wicker next time a redesign comes up.